There are hundreds of retail stock-trading apps for the iPhone, but recently there has been a spate of institutional FX offerings from the major banks. One of the first to venture into this area was Citi, with the CitiFX Pro Mobile extension to its Caplin-powered Velocity e-trading platform. 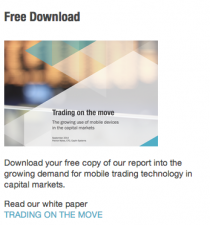 Then JPMorgan announced its MDPro FX trading app. Now Crédit Suisse weighs in with the Merlin offering. I wonder how much flow they’re all getting? is anybody judging them on flow yet? surely each can be seen as a natural (and still newsworthy/differentiating) demonstration of a channel-agnostic institutional distribution strategy? Agree that in the early stages it’s as much as anything about them getting a stake in the game and generating some PR. But I was just wondering whether any institutional traders actual DO walk down the street trading FX on their iPhones. Wouldn’t it be interesting to know how much Citi, JP and CS are actually doing a day through the i-channel? So now you can trade some cable whilst ‘laying some cable’?